Product prices and availability are accurate as of 2019-04-22 02:23:17 UTC and are subject to change. Any price and availability information displayed on http://www.amazon.co.uk/ at the time of purchase will apply to the purchase of this product. 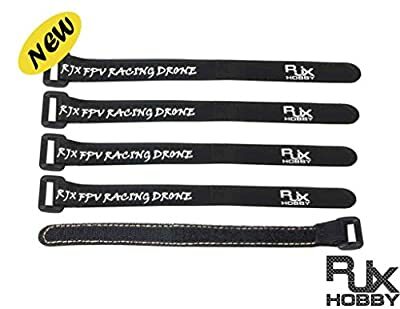 RJXHOBBY Non-Slip Silicone Battery Strap / Camera Straps is Great for LiPo batteries and other components to your RC Quadcopter, Drone, Airplane, RC Car or Truck, Boat, and other models. The newest design of non-slippery grip to assure maximum traction. With these straps, you can wrap it around the entire body, top and bottom plates, and battery, it means you don't have to over tighten to keep the battery from slipping. These straps are more than long enough for any multicopter, having the Non-Slip Silicone does a great job of holding the battery in place using friction in addition to simply wrapping around the battery. These straps are perfect for keeping your battery strapped to the bottom of your quadcopter.